This week Police Officer Keane and K9 Taz took first place in the United States Police Canine Association Region #7 Narcotics Certification. 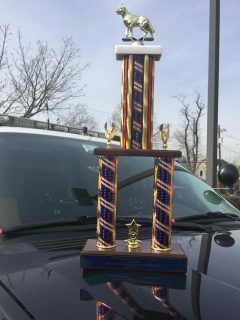 Officer Keane and Taz took part in a narcotics search test held in Yonkers, NY and placed first overall with a perfect score. Taz beat out 21 other K9’s from the region. Both he and Officer Keane will now represent Region #7 in the national competition being held in Raleigh, North Carolina. We are extremely proud of Officer Keane and Taz’s accomplishments. The United States Police Canine Association is the largest and oldest active organization of its kind-“Ever Striving for the Betterment of all Police K-9.” Membership is spread throughout the United States, Canada, and with the Armed Forces, throughout the world. ◾To unite in a common cause all law enforcement agencies utilizing the services of the canine as an aid in the prevention and detection of crime. ◾To promote friendship and brotherhood between all those interested in the training and utilization of the canine in police work. ◾To endeavor to establish a minimum working standard, and improve the abilities of the canine in police work, thereby rendering better service to the community. ◾To establish and maintain a legal assistance fund for acts resulting in civil suits from the use of police trained canines. ◾To coordinate the exchange of any advanced techniques of training of the utilization of police dogs. ◾To improve the image of the working police dog to the populace in general through improved public service in the prevention and detection of crime.